As we head into the holidays, I thought it would be a nice change of pace to find a way to give way to the seasonal stress and spend a moment to de-stress with a little humor in our profession. When Sam Frenzel, a writer for Teach.com, asked me if he could write a guest post on the Best On-Screen School Counselors, I thought this was a perfect opportunity to add some humor into our day and to celebrate the movies that showcase School Counselors in a positive light. Mrs. Taylor never played second fiddle to her football coach royalty husband Eric Taylor, opting to carve out a legacy of her own in Dillon, Texas in this sports drama. Tammy possessed one of the most important skills in every good counselor's repertoire: an ability to meet the students at their level. She never failed to play advocate for the underdog and seemed to genuinely care for her students - regardless of their past. Though her advice may not have always been gentle, her no nonsense attitude always had the students best interest at heart. Emma was a quintessential member of the William McKinley High School faculty in the unforgettable teen musical/drama Glee. Not only did she guide her students through difficult personal and academic problems, but was also an integral part of the wildly successful glee club. Though her personal life had it’s ups and downs, it never interfered with her love of her students and her unwavering efforts to see them succeed. The free-spirited Mr. Rosso is a frequent character on the short lived, but beloved teen comedy Freaks and Geeks. He spoke to his students like adults and, rather than patronizing them, offered topical and current solutions to their problems. He gets bonus points for suggesting The Grateful Dead’s American Beauty record as study music! One of the most memorable characters from this documentary-style show about a scrappy community college football team is the academic counselor Brittany Wagner. She is both a source of support for the football players and someone they take advice from in their pursuit of a better life. Best of all, she is a real-life advisor! As well as being “the mother” to most dominant junior college football program in the United States, Brittany is a nationally respected athletic academic counselor. In Everybody Hates Chris, a coming of age television comedy, Chris Rock plays the role of guidance counselor to a character that he based off of himself. Chris Rock’s Mr. Abbott serves as a no nonsense imparter of wisdom to middle-school aged Chris. He is, as many counselors are, a wake up call for Chris to take his studies more seriously and a reminder to follow his dreams. Although she wasn’t a particularly good guidance counselor, Ms. Perky stole her scenes in 10 Things I Hate About You and provided unforgettable laugh-out-loud moments. What’s another word for engorged? Mr. Porter is the school counselor in the controversial teen drama 13 Reasons Why and is, generally, the worst. When a distraught Hannah Baker comes to his office for help dealing with a whirlwind of events, from bullying to sexual assault, he is dismissive and disbelieving. He does everything wrong that the good counselors on this list do right and, for that reason, has landed himself the rotten apple award for failure in school counseling. Don't be like Mr. Porter. 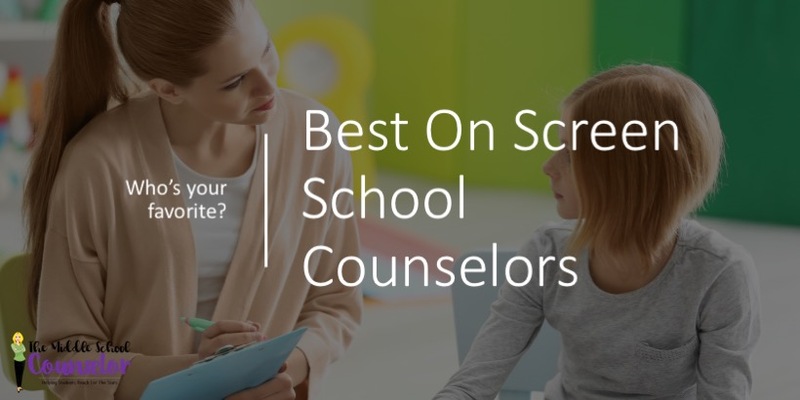 The best on this list demonstrates just how effective school counselors can be in altering the lives of their students for the better. Each of the school counselors on this list come to life through powerful writing and masterful performances and, much like actual school counselors, carry the ability to inspire and amaze. Sam Frenzel’s love of pop culture started at an early age and has culminated in his ability to catch obscure references and dominate a trivia night. He’s a writer for Teach.com based in upstate New York where he covers topics from education policy to teacher welfare. Do you have any favorite on screen School Counselors not mentioned here? I'd love to hear who you think represents our profession well! Leave me a comment!